McCain and Romney were at times bitter rivals during the 2008 campaign. WASHINGTON (CNN) - Sen. John McCain is co-hosting a fundraiser for his former 2008 Republican primary rival Mitt Romney next Wednesday in Phoenix. McCain and his fellow Arizona senator Jon Kyl will headline the event at Chase Bank Field, home of the Arizona Diamondbacks. The fundraiser will benefit Romney's Free and Strong America PAC, and features a $3,000 per person VIP reception along with a $300 per person luncheon. Guess he will not be pushing Palin to run in 2012! Wow.... guess he realized his huge huge huge error in judgement! There's a winning idea. Have McCain, who famously couldn't even fill 500 seat venues for his own campaign, host a fundraiser. 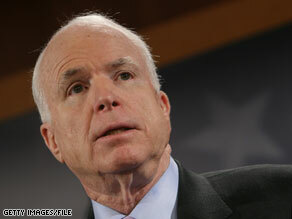 Consistancy is a part of McCain's appeal. Like how he was cinsistantly against G.W. Bush until it was his turn to campaign. Or how his solution during his campaign was less bank regulation. Yes, I'd say this is a winning endorsement. And Romney's nomination will mean nothing unless he moderates his views. Tough time ahead, the Republican 2012 candidate, whoever it is, will have to deliver red meat to the so-called base in order to get the nomination. But that red meat is the same stuff that alienates mainstream voters. Still romney can pull it off if he presents himself as the confident voice of reason. What he may do after he is elected, assuming that will happen, is another story. Here we go-stockpiling cash for another smear campaign. His voting record in the Senate, thus far this year, is the most partisan of his entire career. Such a bitter old man. Still cannot get over his landslide defeat and rejection by the country. Barack reads his lies, Unions Thrive and the Economy dies. Fantastic, the country after 8 months of Socialism Imperial style government are ready for CHANGE WE NEED!!!! Can't wait till 2010 and 2012!!!! What a match up. $3,000 VIP are you serious? Who in the hell has this kind of money in today's economy, oh I forgot, these losers have plenty. OMG...I can't believe all you right wing freaks. The FBI (under Pres. Obama's watch) caught a whole bunch of terrorists yesterday...AND no one got hurt! The USA reveals REAL evidence of a yet to be operational nuclear reactor in Iran...BEFORE Iran was able to cause any harm. And you are still calling him weak and saying you don't feel safe just because he didn't utter the words "wanted dead or alive" or he isn't jumping the gun and sending our children over there to start another endless war! Really people, you make me sick! Thank GOD the President will continue to keep you safe, even though you don't deserve it. The last thing America needs is a CEO president. America is a nation of employees, not entrepreneurs – but that is not how CEOs think. They think that America is a nation of entrepreneurs who make the trains run and pave the highways. Employees are sort of like a truck. You use it for a while, then get rid of it. CEOs prefer low wages to high wages, no benefits to any benefits, and a 12 hour day to the 8 hour day. Thank God Romney is a Mormon. The prejudice of many Conservatives against that religion will save the nation from a Romney presidency. It looks like one Republican who couldn't get the whole-hearted endorsement of a party that has become radically conservative is helping out another Republican who is doomed to the same fate.